Getting married comes with a lot of traditions, and one of the biggest ones is having the bride-to-be wear a diamond engagement ring. Because of their impressive appearance and strength, diamonds are widely known as the stone to buy when proposing. But diamonds are also widely known for their hefty price tag, not to mention their social and environmental impact, and so it’s not surprising that many people opt for something a little bit more unique. This year, brides are obsessed with a non-diamond engagement ring that’s a lot cheaper than diamonds. 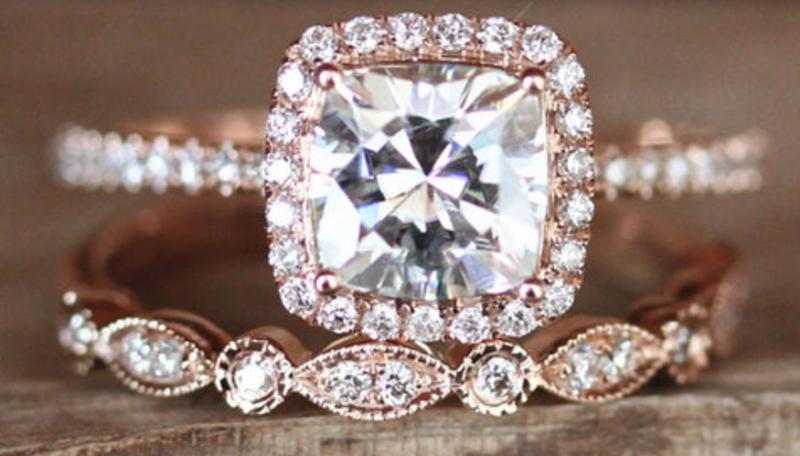 It’s called a moissanite gem, and according to Pinterest, it’s the biggest ring trend happening right now. In fact, searches for moissanite engagement rings are up 294% since 2017. At first glance, it’s easy to confuse a moissanite gem with a diamond — they look remarkably similar. But moissanite is actually completely different. According to Brilliant Earth, it was first discovered in 1893 by a French scientist named Henri Moissan. In a crater created on Earth by a fallen meteorite, Moissan found microscopic particles of the gem. At first, Moissan thought he had hit the jackpot and discovered diamonds, but he later realized that this was a crystal made up of silicon carbide. Moissanite gems that you find today are inexpensive, but that’s because they’re not actually authentic. Natural moissanite is incredibly rare, and so today’s gems are laboratory-created. It took years of practice, but eventually, the particles that Moissan discovered were synthesized, producing the gemstone that is popular today. It’s no coincidence that moissanite looks like a diamond — they’re made to look that way. But they have some big differences, too: Moissanite is extremely durable, but diamonds are more durable (they’re the hardest known mineral on Earth!). Moissanite also has a different brilliance than diamonds, and according to Brilliant Earth, many people feel it creates a “disco ball” effect under light. Lastly, moissanite is more likely to have a yellow or gray tint, where diamonds will not. We can definitely see why people are opting for moissanite rings — it’s a great way to have the traditional ring feel without spending a ton of money. Let’s hope these stick around.